The King of the Court Crown Series makes its third stop of the season in Waikiki, following events in Utrecht, Netherlands, and Antwerp, Belgium. The Waikiki event is a dual-gender affair following two 15-team men’s only events. Six American teams, two Brazilians and two Dutch pairs and teams from five other countries make up the 15-team men’s field. Spain’s Pablo Herrera/Adrian Gavira, the kings of the opening leg of the series in Utrecht, are among the field. Seven of the 15 teams are among the field for the AVP Hawaii Invitational, which follows on Sept. 14-15. King of the Court opens to the women for the first time in 2018 in Waikiki. 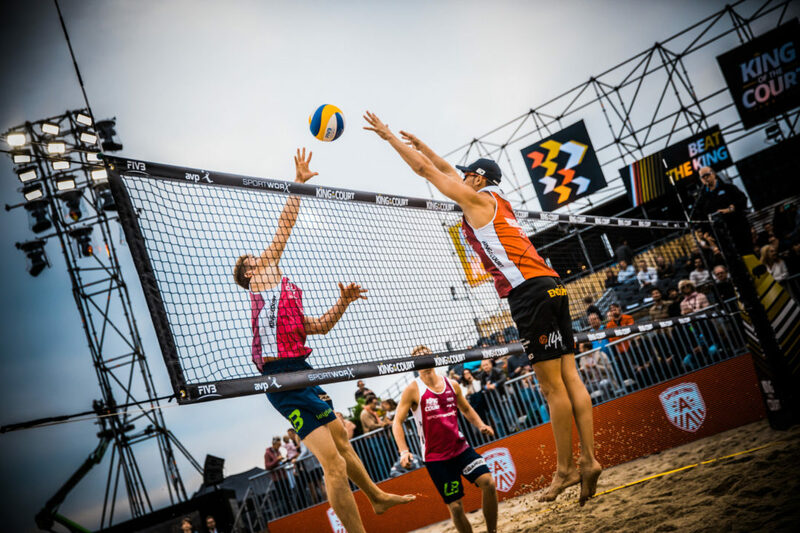 Making up the field are some of the top names in the sport, including seven American teams, the top two teams from Canada and defending FIVB World Tour Finals champs Agatha/Duda of Brazil. Eight of the 15 teams will continue on to play in the AVP Hawaii Invitational on Saturday and Sunday. Unlike a traditional tournament, King of the Court pits five teams against each other simultaneously in a rotation system. There’s a Challenger’s side and a Kings’ side. Challengers serve and points can only be scored at the Kings’ side. If the Kings win a rally, they get one point and stay in their kingdom. If they lose, they’re out and are sent to the back of the line of waiting teams. Challenger then move into the Kings’ end to face the next team. The team with the least points at the buzzer is out. Round one and the finals last 20 minutes max, while Round 2 lasts 16 minutes. In the finals, the first team to reach 15 points wins or whoever has the highest score after 20 minutes.